IAVA is the leading post-9/11 veteran empowerment organization (VEO) with the most diverse and rapidly growing membership in America. With over 425,000 members, IAVA provides valuable resources and empowers veterans to connect with one another, fostering a strong and lasting community. IAVA educates the public about post-9/11 veterans, advocates on behalf of these veterans and builds community among them. Q: What is the She Who Borne The Battle campaign? 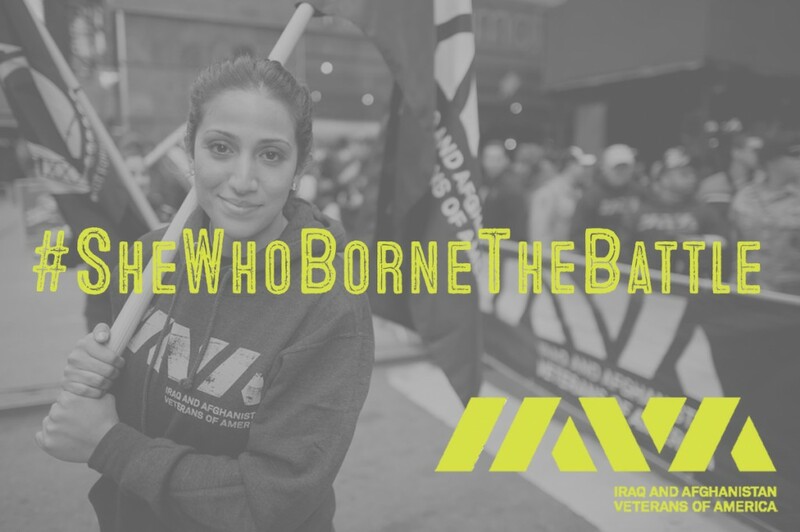 She Who Borne The Battle is IAVA’s most recent campaign to recognize and improve services for women veterans. Our goal is to transform the landscape for women veterans in our country forever. Q: What does the current landscape look like for women veterans? Nearly 345,000 women have deployed since 9/11. While the number of male veterans is expected to decline in the next decades, the population of women veterans will increase. Women continue to take on new roles and responsibilities throughout the services. Yet, their service and sacrifice is often overlooked. Only 27% of IAVA members surveyed believe that the general public treat women veterans with respect. Though the quality of care and services provided by the VA for all veterans needs to dramatically improve, this is particularly critical for women veterans. The number of women seeking care at the Department of Veterans Affairs has increased by 80%. While the VA has created a firm foundation of care for women veterans, it is past time that the VA, with the support of Congress, bring that foundation to scale. Q: What is “She Who Borne The Battle” in reference to? The VA motto: “To care for him who shall have borne the battle and for his widow, and his orphan.” It exemplifies the glaring problem of recognition and barriers to entry for women veterans. IAVA will change the VA motto to represent ALL veterans. Q: Why do you want to change the VA motto? Recognizing women veterans is our top priority. We need to take this cultural problem head on, and it needs to start with the tone that’s set at the VA itself. We can swiftly show every woman who has worn a uniform that we honor her as much as the man standing in formation next to her by replacing the VA’s motto. If women aren’t recognized by the guidepost of the VA, they will not truly recognized for their service in the eyes of all Americans. For more on why changing the VA motto matters, see the letter IAVA sent to VA Secretary Shulkin here. Q: Who decided the VA motto? And who can change it? In 1959, the head of the Veterans Administration, Sumner G. Whittier, established the agency’s motto as: “To care for him who shall have borne the battle and for his widow, and his orphan. When Administrator Sumner G. Whittier instituted the VA motto, he did so unilaterally. He followed no official process; it was merely his choice to assign the motto to the VA. It is within Secretary Shulkin’s authority to remove the outdated motto and replace it with an inclusive message and mission that acknowledges women veterans and honors all veterans. Q: What is the Deborah Sampson Act? The Deborah Sampson Act is a comprehensive bill to recognize and improve services for women veterans. In addition to asking Congress to support a change to the VA’s non inclusive motto, The Deborah Sampson Act addresses gender disparities at the VA to ensure that women veterans are getting equitable care. This bill will provide for enhanced access to VA care and will ensure women veterans are getting the benefits they have earned through their service. Q: Who was Deborah Sampson? Q: I’m a male veteran. Can I join the campaign? Yes! Show your sisters in arm that you have their back, and that the stakes are too high to leave any veteran behind. Q: I’m a civilian. Can I join the campaign? Yes! Civilian allies are critical to accomplishing our goals, especially for gaining recognition for women veterans. Challenge yourself, and everyone you know, to change the way you see veterans.